Art4place and Arts Connect have made a commitment to be artistically involved in this year's Festival of the Walks (FoW). Arts Connect will coordinate activities in Montville and Kondalilla Falls Park; and art4place will be involved in a number of activities in Maleny and Mary Cairncross Park. 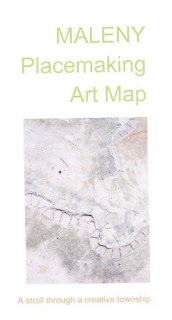 * Saturday 21 August art4place’s Maleny Placemaking Art Map will be launched and distributed as part of the FoW Maleny Street Party starting around 11.30am. * Sunday 22 August (10am-3pm) ephemeral artworks themed on the Birdwing Butterfly will be created by art4place artists in the picnic area of Mary Cairncross Park and throughout the Birdwing Butterfly Walk adjoining the picnic area. * Sunday 29 August there will be a 'Show & Tell' at the Mapleton Markets from 7.30am -12.30pm where art4place artists will join Arts Connect artists display the construction of and finished products of Kondalilla and MCP ephemeral artworks with photographic and possibly public participation presentations. The art4place Maleny Placemaking Art Map and Arts Connect Montville Art Trail will also be available. If you want to be part of creating the ephemeral placemaking art why not come to Mary Cairncross Park between 10am and 3pm on Sunday 22 August - make it a picnic, bring the children - good family and creative fun. It's going to be a gr8 day, looking forward to it.